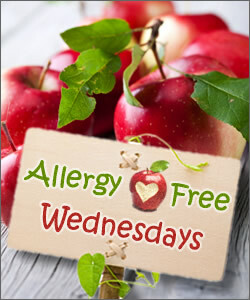 This is a weekly blog hop hosted by myself and 4 other fabulous allergy-free bloggers. Your weekly submissions will be shared on all 5 blogs! Each week, we will feature a favorite recipe (or two) from the week before. *Three weekly submissions max please. *Please leave a comment after you link-up and tell us about your weekly submission(s). Best wishes on your new hop! This is so exciting! I was just thinking the other day that there should be a GF/DF link party and here today I find one 🙂 All of the recipes I post on my blog are GF (for my hubby) but some of them are just regular dinner recipes that happen to not contain any ingredients with gluten…Anyway, I just grabbed the badge and cant wait to see what everyone has to post – I need a dinner idea for tonight! Ooo yes must remember to link up my soup! This is such a great resource! Such wonderful recipes! Thank you all for sharing them. Veronica, I hope you find a great dinner recipe for tonight. Just posted my cultured mustard recipe and forgot to write GF. It can also be DF if you use a vegie culture started instead of whey. WOW-I am impressed! I have never thought to make my own mustard recipe before. Your recipe looks so delicious and I love that it is cultured. Linked up my Quinoa Pilaf! Thanks for hosting Laura! There are a few recipes I'm going to try from the blog hop. thanks for hosting Laura! What a fantastic resource Maureen! This calculator is super easy to use. I updated my favorites on my computer to add this link to it. Thank you so much for sharing!